This past weekend I was involved in an epic battle. As a lifelong pacificist, growing up in an Historic Peace Church, it felt base, ugly and brutal. I found myself doing things I’d rather not report. All in defense of my beehive. Who knew these innocent, sweet, wondrous creatures could be so voracious? But I will report on this, because I’m feeling confessional as I think back on the horror of it. I guess this is how wars get started. Fighting over scarce resources. It was all my fault in the first place. I had been merrily feeding my hives to tide them over this dry Autumnal season, since nectar is just not to be found. They get cranky when I feed them sugar water. It just isn’t nectar—-full of the vitamins and amino acids and minerals they need. Kind of like humans, they become hyper, erratic, irritable and insatiable when the sugar is flowing through their little bodies. As they flooded out of the first hive and began to sting me, I literally dropped the bottle of honey in the hive, into the growing pool of honey. The bees were literally swimming and suffocating in honey. What a way to die. The second hive tolerated me opening them, since they had last been fed honey, not sugar water. As I began to pour the honey, it moved rapidly towards the back entrance, which was sealed, but not airtight. Law of physics. Liquid moves gravitationally towards the earth. As the honey began to drip, no, pour around the closed door, running down the legs of the hive onto the ground, the hive began to buzz with tens of thousands of unknown, hungry bees. My girls were happily sealed inside sipping their new epiphany of delight. But to my dismay, it seemed I had begun the Fall food wars, as honeybees will readily sniff out any potential source of honey and rob it if needed. Fall is the worst, since bees are desperate to put up winter stores. There was no way to stem the steady flow from inside, seeping and dripping outside. Soon it had become a honey trough filled will tiny bee bodies lapping at the growing rivers of sweet elixir. I watched for awhile. The hordes began to gather around the entrance. I shudder now to think of the warfare going on inside as my girls sent their first strike boots-on the-ground guards to fight off the invaders. Then as they grew weary, they sent in the national guard. I could see bees grappling to death outside the hive, as wave after wave of intruders were kept at bay. But they kept coming, bearding around the entrance to assure wave and wave of robbers entering the hive to pillage and plunder. I was no stranger to this. It happened to a hive of mine last winter when I was out of the country. I came back to nary a single bee, only a pile of shredded wax below the doorway. 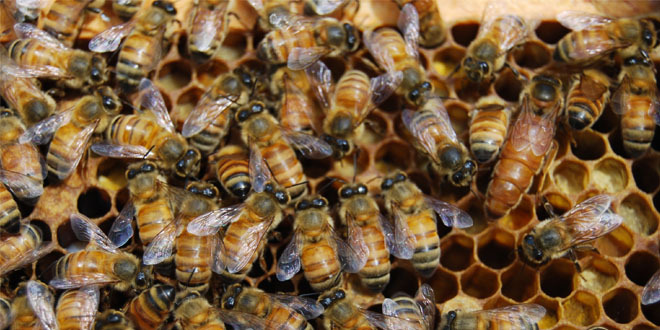 The robbers had chewed out all the winter reserves of pollen and honey, leaving my girls to flee for their lives. It went on for hours. My husband came home from a long week of work to Friday night chaos. He was kind enough to start out holding the tools as I tried to shut down the entrance with mesh and entrance reducers. He got stung below the eye and that was that. He retreated to the house, leaving me to do battle with my head/face veil and shorts. Stupidly, I forgot all my bee protocol about how to cover oneself when going into a “hot hive” situation. I threw on my head veil and waded in with short sleeves, flipflops and no gloves, desperate to stem the tide. And the bees took advantage of my vulnerable skin. Soon I was covered with stings. Likely, 20. Though I might embellish it to 40 or so. But as my adrenaline matched the bees frenzy, I didn’t really notice. At least at that time. I raced inside to google robbing behavior. It suggested that one throw a wet sheet over the hive. I did that. The dark was encroaching. I got the garden hose and began to blast away at the swarm covering the entrance. The bees became sullen and drenched, their wings plastered to their bodies as they clung desperately to the screening I had managed to attach. But they didn’t go away. I lit incense and took a torch to those bees around the entrance. It was all mutinous. We were all desperate. Who knew what was going on inside the hive. Hours later the swarms had begun to lessen. We were all battered and bruised by this horrible experience. But the hive was saved. I soaked in an epsom salt/baking soda bath, nursing my stings. The next morning, I went out to view the girls. It was the peaceable kingdom. Quiet. Sunny. Organized flight patterns in and out with pollen filling their legsacs. They were getting adjusted to the layers of wood and screening covering their entrance. It was definitely inconvenient. But they are resilient, if nothing else. I can’t help but think of war zones. How it starts. How it unravels. How it destroys and traumatizes every being involved. How do people and countries return to normal afterwards? I have no easy answers. It is troubling all around. Bees are instinctual creatures. Humans have the power of reflection. Let us choose against war.